Main Falls with early morning rainbow. Click to enlarge. We must apologies profusely for the delay in getting this newsletter out. Daily visitors to our website rose substantially this year and the volume of booking enquiries we received increased our work load enormously, just not giving us enough time to get this newsletter out... Sorry. We have also been in the process of producing a Downloadable E-guide (more about that later) which has taken a considerable amount of our time as well. The oppressively hot months of September and October have finally been broken by the arrival of the first rains in early November, perfectly on time. Rainfall is still a bit patchy but what a relief from the incessant heat. The sun parched earth with barely a blade of grass is starting to come alive and in no time the landscape will change from golden brown to vibrant green. Everything now changes in the natural world in a perfectly balanced circle of life. Animals will now move away from the River that they have congregated at for the dry months and the flora will burst into life providing sustenance for all living creatures. It's a wonderful time of the year. The Zambezi River is just about at its lowest levels and the local rains have little impact at this stage, but the river level should start to rise in early December. The Falls are still spectacular. 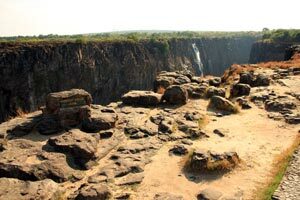 Devils cataract and Main Falls are flowing nicely but Horseshoe Falls and Rainbow Falls are completely dry, which gives you a great opportunity to look right into the deep chasm of the gorge and the raging Zambezi below. Eastern cataract only has a few rivulets, so if you are staying in Zambia you need to get across to the Zimbabwe side! Tourism numbers picked up substantially during August, September and October which made many of the tour operators and accommodation establishments very happy. November has however been pretty quiet. The quiet before the storm we think, as Vic Falls town braces itself for the impending onslaught of visitors over the Christmas and New Year period. 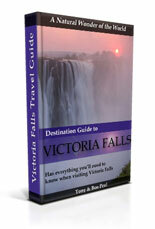 We are very excited to announce the launch of our very own Victoria Falls Destination E-guide. Every day we gets asked dozens of questions about every aspect of travel to the Falls, so we decided to gather all the questions together, answer them and produce a downloadable guide for people to access the information easily. We have included our Tips in just about every section to help save time, money and frustration when visiting Victoria Falls. Apart from all the information we have included maps, photographs, slideshows, checklists, a local language guide, an activity fact file, a tour of the falls, a calendar, discount vouchers and much more. Jet Boat - Regal Tours and Safaris recently launched a new jet boat operation. This activity involves a high powered jet boat racing up and down the Zambezi at speeds of up to 100kms per hour in rapids 1 and 2 just below Victoria Falls. This Adrenaline packed activity sadly did not operate for long as the specially designed boat imported from New Zealand didn't negotiate one of the waves to well and nose dived into the water sinking the entire boat. Fortunately no one was hurt and everyone made it to the banks safely. Nyami Nyami the Zambezi River god is the only one who knows where the the boat is. 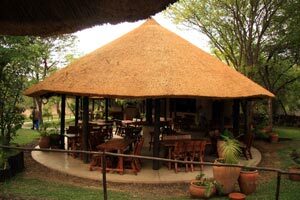 Victoria Falls Rainforest Restaurant - Huge controversy raged over the opening of a newly constructed restaurant and shop at the entrance to the Victoria Falls Rainforest Park by tour operators Shearwater Adventures. Environmentalists, curio traders and other tour operators objected citing that the UNESCO's World Heritage status of Victoria Falls was threatened. 1) Shearwater clandestinely partnered with Zimbabwe National Parks to be awarded this licence. 3) The National Museums and Monuments of Zimbabwe (NMMZ) and Zimbabwe National Parks (ZNP) have been in conflict with each other as to who has jurisdiction of the Rainforest National Park. 4) The livelihood of 100's of curio vendors outside the Rainforest Park would be threatened. Shearwater Adventures have categorically maintained throughout the controversy that they have done nothing underhand and that the award of their licence was completely above board. The only dispute being between NNMZ and ZNP. There are UNESCO regulations pertaining to the site. The UNESCO regulations say, among other things, that there should be no developments in an area which is not already designated a facilities area. At the height of the conflict NMMZ took control of the Rainforest Park and ousted Zimbabwe National Parks officials. This action was blown out of proportion by the press who stated that an armed struggled had ensued, when in fact this was not the case. NMMZ did take control of the Rainforest Park entrance for a short period of time with ZNP relinquishing control in a peaceful manner. After discussion behind closed doors it was resolved that these were both State run authorities but that ZNP had jurisdiction. The shop that Shearwater have set up is an upmarket shop. It is not a curio store, in fact they do not sell curios similar to any curio traders outside the Park therefore the likelihood that it will affect the livelihoods of 100's of curio traders is minimal. The whole entrance to Victoria Falls Rainforest park was in desperate need of revamping and updating. The information centre was dull and outdated and the toilets facilities were not up to standard. Shearwater have improved the whole facility dramatically and brought it up to international standards. The information boards now on display are a vast improvement on what was there previously. The restaurant block has been tastefully designed and built and blends in well with the surrounding environment, it is the bare minimum that an international traveller might expect. Tourists are now able to enter the Rainforest Park (having paid an entrance fee of US$30) wander around the Falls enjoying this marvellous spectacle and then rest and enjoy a bite to eat before going back to their hotels or indeed wandering around the Falls again. Presently the dust has settled and operations are back to normal. We are currently investigating this whole affair and have been to see the owner of the gallery, who has a string of excuses as to why the goods have not yet been shipped, we hope to get to the bottom of this and at least get the money returned to these unfortunate customers. Please be aware of this problem and warn others but also understand that this is not a true reflection on all traders at Victoria Falls. You must just be very careful when buying something and then asking for it to be shipped home. Make sure the individual or company has been recommended to you or that they can show you details of previous shipments and also who their shipping agents are. If in doubt rather organise your own shipping through the Fedex agency in the Falls. This sort of thing casts a very unfavourable light on Victoria Falls and along with other residents in the Falls we will do everything in our power to put an end to this dishonest behaviour. If indeed this turns out to be a fraud case we hope that these perpetrators will be brought to book and stopped from trading any more. New Years Eve Party - This years "New Years Eve Party" is set to supersede all parties of the past. It's likely to be one huge rock festival with some of the best artists from Zimbabwe and South Africa performing. 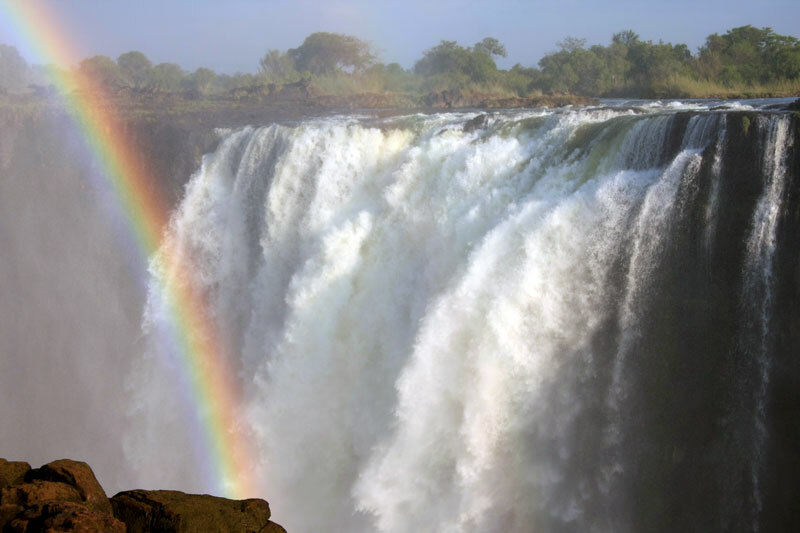 It will create a new hype about Victoria Falls. Most accommodation establishments are 100% fully booked (camping still available) and the activity tour operators are extremely excited about the influx of people which promises to ignite Victoria Falls as a premiere tourist destination once again. This years line up includes The Parlotones, Mann Friday, Ghapi, Evicted, Kate Douie and many others. The festival is spread over two nights with the Parlotones playing on the 30th and Ghapi, the drummer and singer with wild hair, bringing in 2011 with a bang. Tickets numbers are supposedly being restricted to 3000 with standard tickets costing US$40 per night. The Zambezi Traveller - The Zambezi Traveller is a new quarterly publication, it's first issue was launched in June of 2010. Their third issue has just gone to the printing press and will be out next week. Currently 25 000 copies are printed per issue for Free distribution. This tabloid sized publication is jammed packed with interesting articles, stories, news, adverts and information on this whole area, with individual sections on Livingstone, Kariba and Lower Zambezi, Chobe, Mozambique, Victoria Falls, Okavongo and Hwange. If you have any interest in these areas, we would highly recommend getting a copy, there is nothing else quite like it out there. If you would like to subscribe for FREE please email teddy@yoafrica.com They will send a copy to you anywhere in the world and won't even charge you for postage. Explorers Bar - During the 90's Explorers Bar in Sopers arcade was the place to go for a lively bit of nightlife. In recent years it's popularity waned slightly but it has just reopened under the new ownership of Tim Element and Deidre Adams and is set to start humming again. Mike Saunders the young new manager has brought in Live entertainment and theme evenings which are set to draw the crowds in. Victoria Falls Bridge Guided Tour - The Victoria Falls Bridge to me has always just kind of been there. Although aware that it is a historical masterpiece, I've really associated it more with bungee jumping than anything else. I was invited to join the newly opened Guide Bridge Tour and to be perfectly honest I wasn't that excited. However I was to be totally surprised and enthralled by the experience. The Tour is broken down into three sections the first being a theatrical presentation by an actor impersonating George Imbault who was the Chief Engineering during the construction of the bridge way back in 1904-5. He masterfully transports one back in time for about 45 minutes as he flamboyantly regales stories of how and why the bridge was constructed, the enormous problems they encountered and how they overcame them. It's fascinating and enthralling. I was left marvelling at the brilliance of this Victorian engineering feat, when you think they built this without any of the fancy computer technology that we take for granted these days. At that time this was definitely still deepest darkest Africa and communication with civilisation would take months, imagine if they forgot to order a certain piece! The whole bridge was manufactured in Britain and then transported in pieces by ship and then railroad. contracted in the night to the extent of exactly 1¼ inches, the two sides had dropped into place and fitted perfectly. The second and optional third part of the tour includes a guided tour of the visitors centre and a walk under the bridge itself which really gives you an insight to this awesome construction. I would highly recommend doing this tour. At the age of 10 my parents and I left the UK over land to Africa, a trek of four and a half months. We arrived in Livingstone on the 30th of March 1947 and visited the Falls for the first time the next day. We will feature in this and upcoming Newsletters a series of articles on how and why the Railway line reached Victoria Falls. Cecil John Rhodes (18531902) was an English-born businessman, mining magnate, and politician in South Africa. An ardent believer in colonialism and imperialism, he was the founder of Rhodesia, which was named after him in 1895. At the time Rhodesia was divided by the Zambezi river into Northern and Southern Rhodesia, later renamed Zambia and Zimbabwe, respectively. 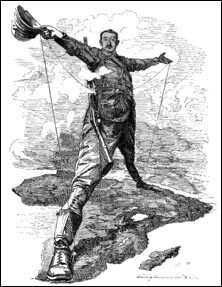 It was Rhodes ambition to see a red line across the African continent from the Cape to Cairo (on geo-political maps of the period, British dominions were always shown in red or pink) which he believed would consolidate British interests in Africa. Rhodes felt the best way for this to be achieved was through the construction of the Cape to Cairo Railway and Rhodes placed a great deal of emphasis on this after becoming Prime Minister of the Cape Colony in 1890 and until his death in 1902. The Cape to Cairo Railway was never completed for a variety of reasons, not least of which was the death of Rhodes in 1902, and the fact that the British Government, under the leadership of Lord Salisbury, did not share Rhodes enthusiasm for the Cape to Cairo vision. The railway north eventually terminated at Elisabethville (now Lubumbashi) in Zaire (now the Democratic Republic of Congo or DRC), and reached there in 1910. In 1896 Rhodes instructed that the railway must push north as rapidly as possible, and gave orders that the line must reach Bulawayo before the end of 1897. At the time the railhead was still 492 miles from Bulawayo. The contractors, Pauling and Company, enrolled large forces of locals and achieved the feat of laying 492 miles of track in 500 working days, reaching Bulawayo in October 1897, a quite extraordinary achievement considering the harsh conditions. Originally the Cape to Cairo route was planned to go through the capital of Southern Rhodesia, Salisbury (now Harare), and then across the Zambezi at Chirundu towards the eastern end of todays Lake Kariba. However the discovery of rich copper deposits to the north west of Zambia, and huge coal deposits in Wankie (now Hwange), caused the axis of European development to shift. The proposed railway was realigned with the new coalfields and copper deposits, and the railway suddenly included Victoria Falls. The line reached Wankie in December 1903. Passengers wishing to travel on to Victoria Falls from Wankie were then transferred to a Zeederburg coach, a horse or mule drawn carriage, for the remaining 68 miles to the Falls. The line from Wankie to Victoria Falls was completed in April 1904 and the Victoria Falls Railway Station was opened in mid June 1904. The stage was now set for the construction of the Victoria Falls Bridge. Next issue will be about the construction of the bridge. The Wild Horizons Trust was recently asked by the Zimbabwe Parks and Wildlife Management Authority (ZPWMA) to rehabilitate two young elephant from Hwange National Park. These orphans were amongst other animals destined for a foreign zoo until ZPWMA decided the consignment should be released back into the wild. For the two adolescent elephants it would not have been possible to survive in the wild without the social structure of a family herd, and so the pair, named Makwa and Kennedy were brought to the Wild Horizons Wildlife Orphanage and Sanctuary just outside Victoria Falls. Miz Ele, the matriarch of the sanctuary herd, who recently lost her baby due to a breech birth, and Coco, another calf less female, have taken over the nurturing of these youngsters and after the initial trauma, thankfully both have settled well. Anti-Poaching activity continues to be a major component of the Trust work and elephant, buffalo, impala and warthog have all had snares removed, as far afield as Kazungula. Closer to home, chasing the elephants raiding property in Victoria Falls town with chilli pepper gun has become a nightly exercise! Dragonflies - In December swarms of Dragonflies often gather around the Devil's Cataract area. This already magical spectacle becomes even more magical. Thomas Baines - The artist and explorer Thomas Baines joined David Livingstone's second expedition to Victoria Falls in 1862. He spent 12 days sketching and painting his now famous artworks of the falls. Baines and Livingstone had opposing temperaments and did not get on well together, a bit unfortunate for them both. They ultimately fell out over an argument about sugar rations. Pitipiti should have been a very happy woman. She was married to a rich man who had many cattle. But after years of marriage, she was still unable to give him the many children which a man like him deserved. he went to see many people in the hope that they would be able to solve her problem; but to no avail. Day after day, she watched as her husbands love for her faded away before her very eyes. She was very sad the day that her husband married a new wife so that he could at last have children. But she was also happy for him when she learned that his new wife had given him a child, and then another. Each time she learned that the new wife had given birth, she went to offer the newborn a gift; yet she was refused each time. Read full tale "Click Here"
That a new born Giraffe measures about 6 feet at birth and that their scientific name is "Camelopardalis." which literally translated means Camel Leopard. The Giraffe's tongue measures 27" long and they have the same number of cervical vertebrae as a human. Their heart is 24 pounds in weight and 2 foot in length. They sleep for no more than 5 to 30 minutes in a 24 hour period. Saving Zimbabwe is the gripping story of a group of extraordinary black and white Zimbabweans who lived together forming "The Community of Reconciliation". They chose love over hate and integration over segregation. They believed in harmony over discord and that loving your enemies was a higher way of life. This powerful and emotional book has the opportunity to really impact the people, communities, and nation of Zimbabwe. Bob Scott offers solutions to the challenges Zimbabwe still faces and if we could only adhere to its principles Zimbabwe could be saved. I recommend it highly.